All-In-One Project Invoice allows you to combine project invoices in Dynamics SL with the expense reports and attachments listed on the invoice. When printing invoices in Dynamics SL, the All-In-One Project Invoice gives you the option of including Expense Reports on the invoice and combining them into one PDF. Along with including Expense Reports, you also have the option to include the attachments related to the Expense Reports, as well as AP Expense attachments. a single PDF for each invoice with related attachments, the 'Combine All' feature lets you combine multiple invoices (with their related attachments) into a master PDF. ​Have you been dealing with issues related to using QuickSend due to dropped network packets? The Project Invoice Email Scheduler enables you to schedule emails to send with the invoices attached as PDFs. This feature replaces QuickSend and does NOT require AppServer to be running. Sample consolidated PDF with expense attachments. Example of an output folder which contains PDFs for each project invoice with its expense reports and attachments, as well as a folder for each invoice that contains the individual attachment files. The Print Invoice w/Attachments PDF screen lets you filter for the invoice(s) you're looking for, include Expense Reports & attachments, combine all into one PDF, and email the PDFs. How many PDFs will be created? Everything will be combined into one PDF at the invoice level. In this case a single PDF will appear in the output folder for that invoice, along with a separate folder that includes all of the related attachment files. If using the 'Combine All' feature, all of the selected invoices will be combined into one PDF. How does it determine which files to link to an invoice? Are you required to have those attachments in a specific file directory? 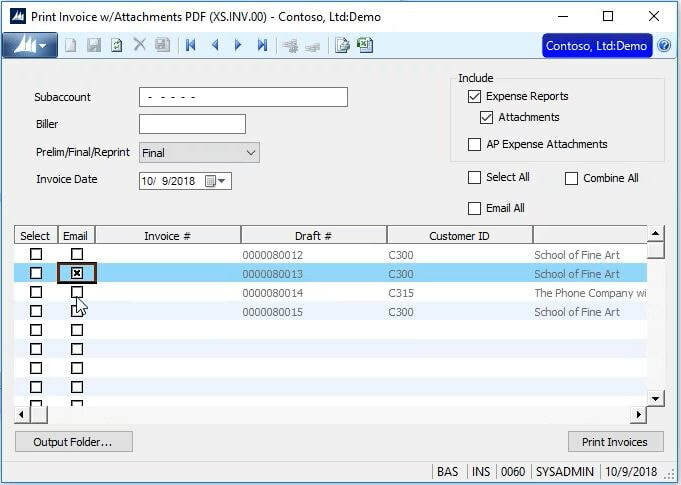 ​All-In-One Project Invoice searches in the specific attachment folders setup within Dynamics SL to find the files and determine their relationship to a project invoice. ​What file types does All-In-One Project Invoice support as attachments? ​*More file/image formats can be configured upon request. Have questions about an ISV solution? ​For more information on this Dynamics SL ISV solution, please contact us. Are you a Dynamics SL partner? Visit our Partner Portal.